Our newest add on as far as our music part of our services! 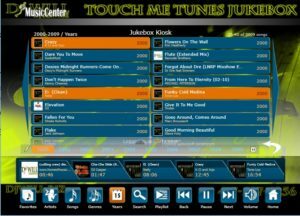 Touch me tunes mobile jukebox! New times in our world with phones, laptops, tablets have made me make this for events. I had the problem of getting brides and regular events calling going back and forth on having a DJ or using there phone the problem was $600.00 vs no PA sound, no lighting, no mics, no interaction. I was thinking what can i do to make this problem work for everyone. BOOM! This is where the jukebox package came into play. I am very creative and will do ANYTHING to make a customers event work and make them happy. NO DJ with this package the guests pick out the music. Cheaper, Simple, PA sound, Lighting, & mics, Custom jukebox screen to your event. NO DJ, NO interactive games "wedding reception", More basic dance lighting, DIY set up for Jukebox package only "but super easy". Please go to package tab and compare jukebox vs Live Dj to see what is best for you. For more info call us 417 597 8256 and Dj Will will explain any questions. Also I can set up a meeting and can bring the screen will show you around. P.S. ALL JUKEBOX LICENSES, SONGS, AND NAMES HAVE BEEN PAID AND HAVE A BUSINESS LICENSE FOR IT.